Product #2369 | SKU BEHD300 | 0.0 (no ratings yet) Thanks for your rating! 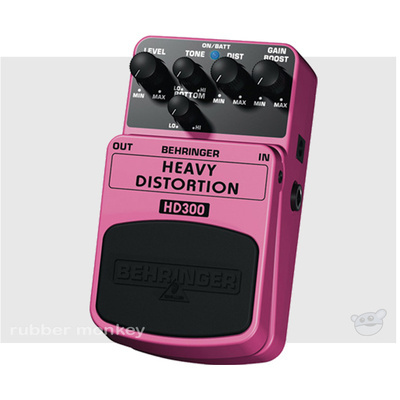 In addition to providing loads of devastating distortion, this little sonic warhead allows you crank up the bottom-end and the gain, to lay waste to everything in your path. With its dedicated GAIN BOOST, DISTORTION, TONE, BOTTOM and LEVEL control, you can dial in a trademark sound all your own. The blue status LED tells you when this pedal is activated, and the rock-solid on/off switch maintains outstanding signal integrity in bypass mode. You can power this behemoth with a 9 V battery or a PSU-SB DC power supply (not included).